Painting word pictures (and pencil ones) of the past [Frederick Noronha]: It seems like ages ago when one of those expat Goans wandering the lanes of their homeland, and often struggling to cope with the changing reality, dropped in at my home. Mel D’Souza had the idea for a book, which he planned to work on when back in Canada. Not too many years later, he presented me with a copy of ‘Feasts, Feni and Firecrackers‘. 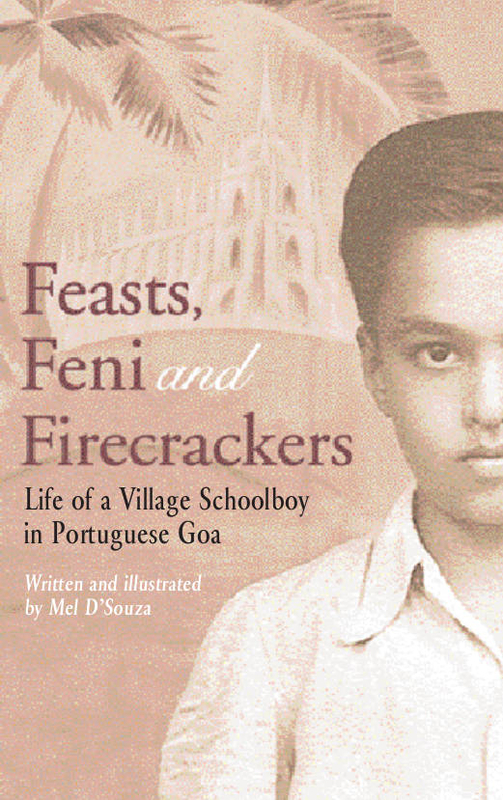 If you’re guessing what it is all about, its sub-title explains it all: “Life of a Village Schoolboy in Portuguese Goa”. This is a book D’Souza Mel himself wrote and illustrated. The latter is important, because it has a number of charming illustrations set in Goa. It harkens back to a Goa of yore, one which many who lived here would remember and recognise. My first memories of Goa go back only to the late 1960s, but even then there were strong traces of the Goa that was, and a place which was drastically changing even before our eyes. Combining images and texts, Mel D’Souza, an expat, ex-Africander (as Goans who were settled in Africa then were called) and an artist based in Canada, does a fair job in documenting that era. His book is made up of short and light essays, each depicting the period of Goa in the mid-20th century. This rather slim book (168 pages) is divided into six sections. One deals with the author’s roots, both as a “village boy” and centred around his home. The largest section of 15 brief word-sketches deals with “Saligao in them days”. Once not too long ago, this was one of the more prominent villages of Goa (and don’t forget, even Goan Catholics are known to have subscribed to a form of hierarchy based on caste). This might explain the pride with which D’Souza looks back. But, on the other hand, Saligao is also typical of most Goan villages of those times. It has its own village family nicknames, its forms of “village transportation”, its bicycles, village doctors and beggars. Mel D’Souza’s keen eye doesn’t overlook the “village oddballs” and its craftsmen. Today, when villages have become mere dormitories for many of us, we need to remind ourselves that these were productive centres not too long back. Mel points out that the craftsmen (in then mainly-Catholic Saligao) were largely Hindu by faith and comprised of stonemasons, carpenters, shoemakers and goldsmiths. There were Catholic tailors too. He describes each with enchanting detail. From there he moves on to the lore pertaining to “worship, weddings and witchcraft”. The last might make for a good alliteration, but it also might be more than a trifle unfair term to describe beliefs of the past. ‘Evil eye’ was a Goan tradition (Catholic too), which many of those times believed in. Today we might see it as superstition, but it obviously helped people cope in uncertain times. Goa, in those times, wasn’t as much connected with “fun”. But Mel D’Souza sees enough of this to create a section titled ‘Fun, Frolic and Frivolity’. Of course, this is a locally defined reality, not touristic. It deals with ks the festival of Sao Joao (involving jumping into wells for a swim and swig at the start of the monsoons), village games, tropical trees, the locals’ relationship with the beach in those times (largely referring to Calangute, in North Goa), Goan theatre, football and “fighting bulls”. Some of his essays which give his take on Goa then look at Customs and Quirks, and Memorable Moments. Each of the book’s six sections have half-a-dozen to over a dozen short essays. Each essay focuses on one topic which caught D’Souza’s fancy. The reader might be right in calling this a subjective look at Goa, because it is one that focuses largely on coastal, Catholic and middle-class Goa. The humble artisan who makes it to its pages is also seen via middle-class eyes. But then, of course, writing itself is a subjective act. Mel D’Souza’s sketches lend a charm which few can disagree with. Likewise, his choice of subjects, and the fact that his writing is done in a very friendly tone, could make the book easy to appreciate. Take his essay on the Mocidade Portuguesa, for instance. Today, this is talked about in hushed whispers mostly, given that it was the youth brigade of Portugal under the dictatorship of Salazar. Mel D’Souza looks at it without embarassment or nostalgia, but just describes it like it was — khaki uniforms, Portugal’s court of arms as pocket badges, basic military drills and rendering with gusto the Portuguese anthem, diverse marching styles. But this is not a book about politics. Nor is it one that focuses on history in a formal sense. All it sets out to do is to paint word pictures (and pencil ones) from the past. It seems to do a useful job; but don’t take my word for it!